California has a vast number of insect species: estimates run 30,000-35,000 or more, and even in the better known groups, new species occasionally are discovered. 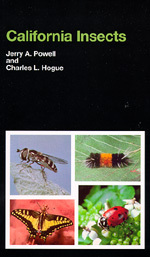 This volume is the first attempt in more than half a century to summarize knowledge of this rich insect fauna, and the first work ever to provide a field guide for beginning students, and the nonspecialist reader. It selects about 600 of the more characteristic kinds of insects to represent the huge variety known. Most of these are conspicuous kinds often noticed in cities or in natural areas by gardeners, hikers, fishermen, etc. For each insect, distinguishing features of its appearance, features of its biology, and its geographical distribution in California are summarized: and an illustration (photograph or drawing) is given of the adult or some other stage. California Insects will serve as a convenient, compact introduction to the identification and understanding of these often strange and fascinating creatures. Used with other information sources cited in the text, it provides the student, collector, or naturalist a means of efficiently developing knowledge of specialized groups of insects. Jerry A. Powell is Professor of the Graduate School and Director of The Essig Museum of Entomology at the University of California, Berkeley. He has written extensively on Lepidoptera and devotes about 75 days each year to field research. Charles L. Hogue was Senior Curator at the Natural History Museum of Los Angles County. He wrote numerous popular and technical papers, mainly on Diptera, as well as several general books on insects. He died in 1992.